Khalifa Port, strategically located halfway between Abu Dhabi and Dubai, was officially inaugurated on 12.12.12 by the President of the UAE, His Highness Sheikh Khalifa bin Zayed Al Nahyan. 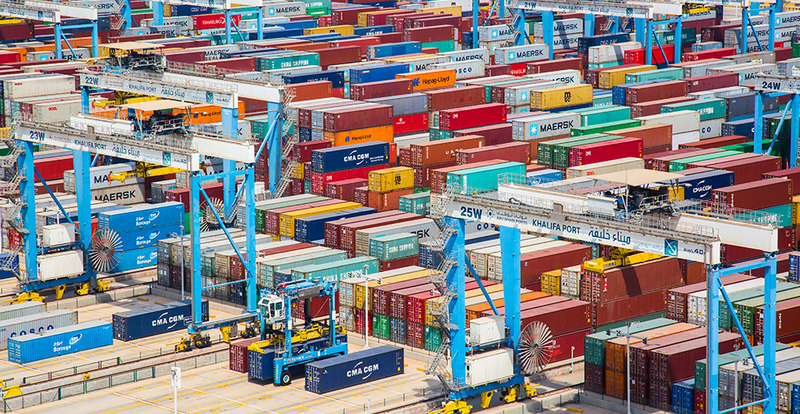 The deep-water port is the first semi-automated container port in the GCC region. Construction of the port was carefully planned to keep environmental impact to an absolute minimum. Khalifa Port’s 8-km long breakwater, the longest in the Middle East, allows the Gulf’s currents to flow freely, while protecting and preserving the local marine ecosystem. 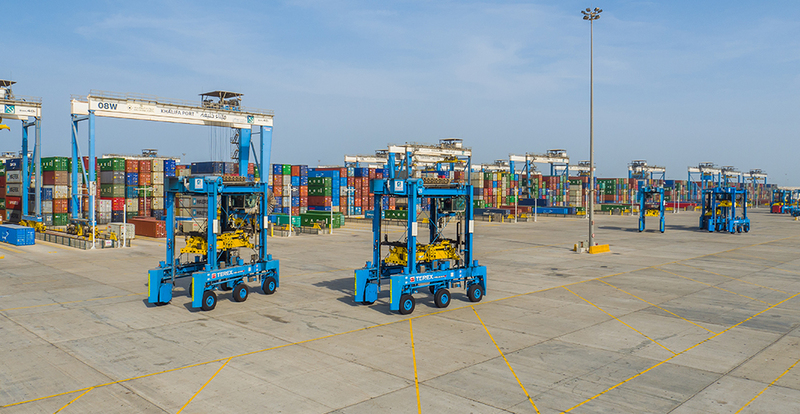 Owned by Abu Dhabi Ports and operated by Abu Dhabi Terminals (ADT), the port handles general cargo, container, roll-on and roll-off (RoRo) as well as break-bulk activities. Connectivity is at the core of Khalifa Port’s uniqueness. It serves over 25 shipping lines, offers direct links to 70 international destinations, and boasts an intermodal transport network facilitating efficient transportation and logistics across sea, road and air. The port will also be the first in the UAE to be linked to the new Etihad Rail network, which is currently under construction. Khalifa Port features state-of-the-art maritime infrastructure, including twelve of the world’s largest ship-to-shore quay cranes, 42 automated stacking cranes and 20 straddle carriers. With the ability to serve the largest ships at sea, and flexibility for future expansion, the port also currently allows the handling of all of Abu Dhabi’s container traffic with an annual capacity of 2.5 million TEUs and 12 million tons of general cargo. Khalifa Port is being developed in stages as industry demand grows. Due to exponential business growth, the Abu Dhabi Ports board recently approved expansion plans to start construction on a new channel, which will increase the draft to -18.5metres. The expansion also includes the creation of a new island; adding 3km to the current 1 km of the quay wall taking it up to a total of 4km. Post construction, all general cargo and RoRo operations will shift to the new island. 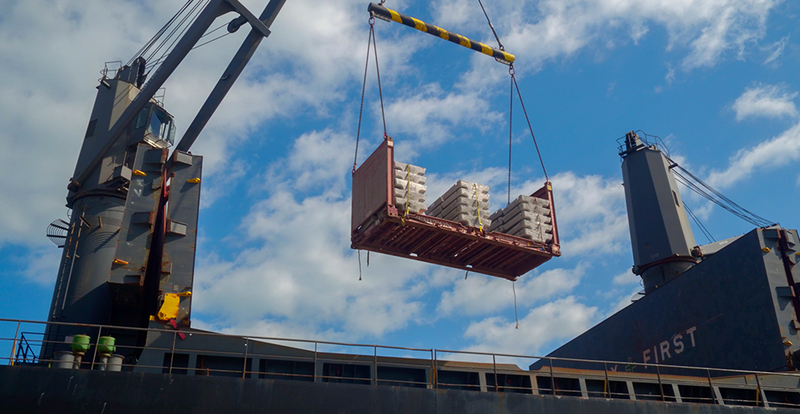 When all development phases are completed, the port is expected to increase its capacity for container volumes to 15 million TEUs and 35 million tonnes of general cargo per year. In Q2 2018, Autoterminal Barcelona, owned by the Noatum Maritime Group, and Abu Dhabi Ports, signed a shareholder agreement for the creation of a joint venture company called Autoterminal Khalifa, to manage the RoRo/car terminal in Khalifa Port under a 15-year concession. The 300,000m2 car terminal, with more than 550m of dedicated quay, located in Khalifa Port, will provide a geo-strategic location for import traffic of vehicles, which is set to increase dramatically in the coming years. The second strategic deal, also announced in Q2 2018, was the signing between Abu Dhabi Ports and Mediterranean Shipping Company (MSC), a JV between ADT and Terminal Investment Limited, based on a 30-year concession agreement with possibility of 5 years extension, positioning the UAE as the premier shipping hub of the Middle East.